The graves of four First World War servicemen, buried in St Mary’s churchyard, were honoured as part of the community’s annual ‘Bygone Buriton’ exhibition in September 2016. And scores of visitors – including families from across the country – paid their respects as they learnt more about Buriton’s involvement in the conflict. 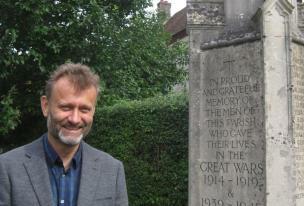 Actor and comedian, Hugh Dennis, attended the event and spent over an hour talking with villagers about the array of materials which have been brought together in the local history project. Hugh visited Buriton as an ambassador for the Commonwealth War Graves Commission’s ‘Living Memory’ Project and encouraged everyone never to forget any of those who have given their lives serving the country. He paid special tribute to the community of Buriton for collecting so much information – particularly about the parish’s First World War Servicemen – and for making it available in such an accessible way. Each of the four men buried in Buriton has a particularly poignant story and one visitor travelled from Basingstoke to bring a series of beautifully embroidered greetings and Christmas cards which one of these men had posted home during the war to his relatives in Weston. Frederick Shepherd had served as a Gunner in the 25th Battery of the Royal Field Artillery in France and later in Turkey. Whilst serving there he was thrown from a horse and, despite a series of operations, died of his injuries back in Britain some time later. Eileen Cottrell’s grandmother had been a sister to Frederick and the family has now kept the treasured correspondence for over a hundred years. Almost 200 men had left the parish at some time during the conflict – out of a population of less than 800 people. Information has now been collected for almost 140 of these ‘Brave Boys of Buriton’ and a special presentation at the exhibition explained their roles. Visitors to the exhibition came from as far away as Coventry , Nottingham, North Wales, Oxford , Worthing, and London as well as many from Petersfield and surrounding villages. People brought old photographs of the parish to add to the village’s archives but the organisers are always looking for more!